The first time I did a post highlighting my food for a day on the 21 Day Fix, I did it as an example for some of my challengers and customers. Imagine my utter surprise when it went on to be THE most-viewed post here on my blog. Crazy, right? I've been thinking about doing another post similar to that one, but life kind of got in the way (and I took an unscheduled hiatus from the blog as a result). That post never happened. Now? I think it's time. Not only have I been thinking about doing another post, but now I think I need to do one for *me. * I could really use the extra accountability. SOOOOO, shall we get started? Breakfast is pretty standard for me - which is good because that means I don't have to think much. It's almost ALWAYS 2 eggs, a vegetable, and either one or two whole grain waffles. Most of the time, I stick to one because my yellow containers are extremely valuable to me. hehe. 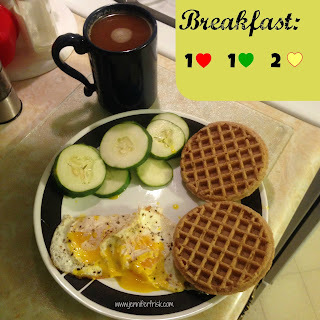 This breakfast as pictured, though, is 1 red (eggs), 1 green (sliced cucumber), and 2 yellows (whole grain waffles). 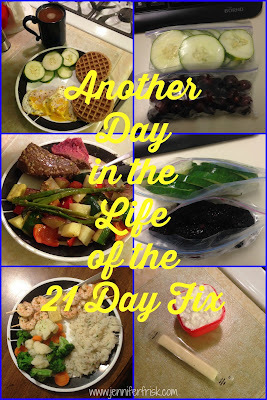 Side note: when I first did the 21 Day Fix last year, the hardest adjustment for me was giving up my flavored creamer. Well, it only took ~ a year, but I found something I like EVEN BETTER. 1/4 cup unsweetened vanilla almond milk + a dash of liquid stevia = the best part of my morning. My first snack of the day is pretty basic. I have a hard time getting all my fruits in each day. I don't know why, but I am just NOT a fruit person, for the most part. Veggies? I could snack on them until the end of time, but fruits just aren't my cup of tea. Sooooo, snacks always have a fruit in them. 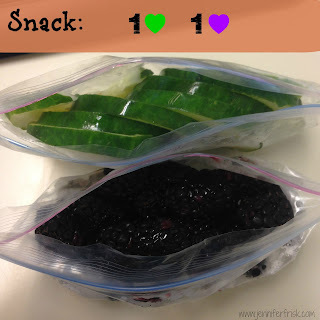 Today's first snack is sliced cucumbers and blackberries - easy finger foods for the day. Lunch each day is almost always leftovers from the night before, and today was no exception. 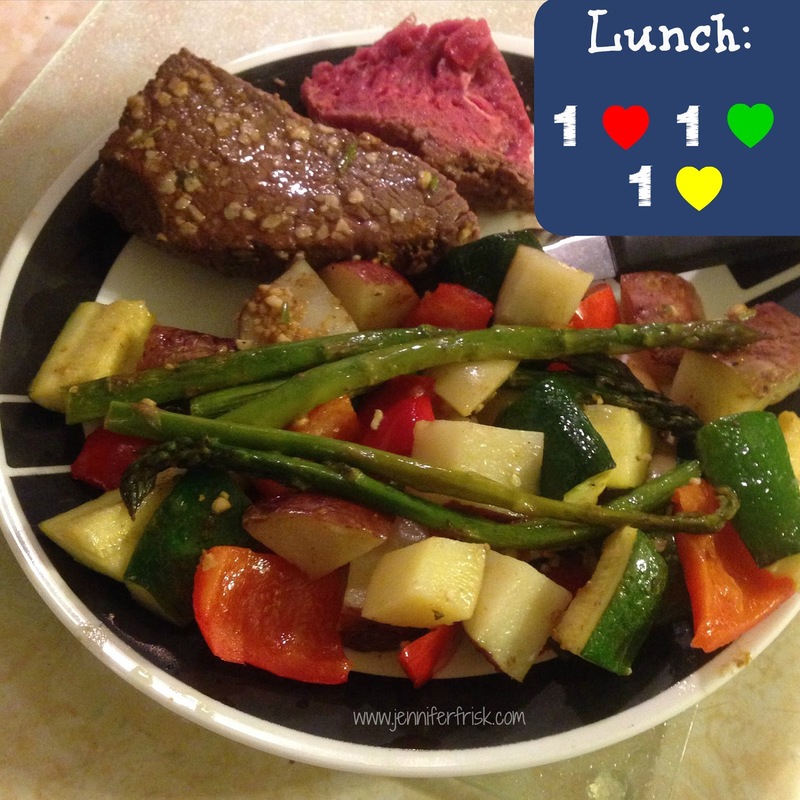 1 red container of sirloin (and yes, I DO like it on the rare side), 1 green container of mixed veggies - including zucchini, peppers, and asparagus - and 1 yellow container of potatoes. The veggies were roasted in a sauce made from just a bit of orange juice, garlic, and balsamic vinegar. Slight kick and a bit of sweetness. Yum! I tend to hit a bit of an afternoon slump right around 3-3:30 every day, so I try and have a heartier snack for the afternoon. 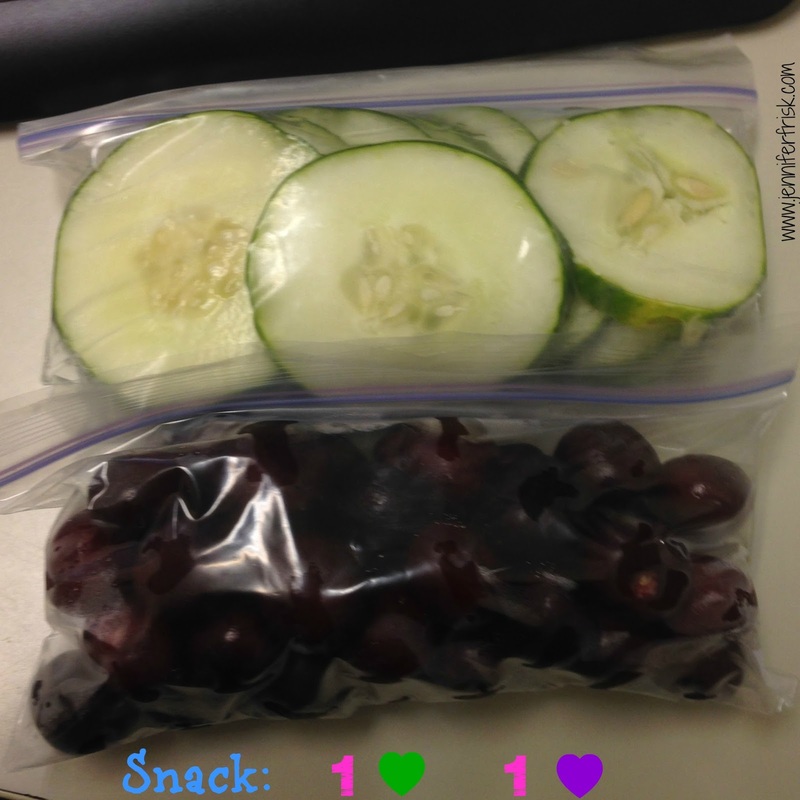 Today's included a green (cucumbers are one of my favorite veggies, if you couldn't guess from today's list of foods), 2 purples (cherries in the bag and tropical fruit in my shake), and 1 red (my awesome shake!). I get the carb load from the fruits (gotta get ready for my workout after work!) 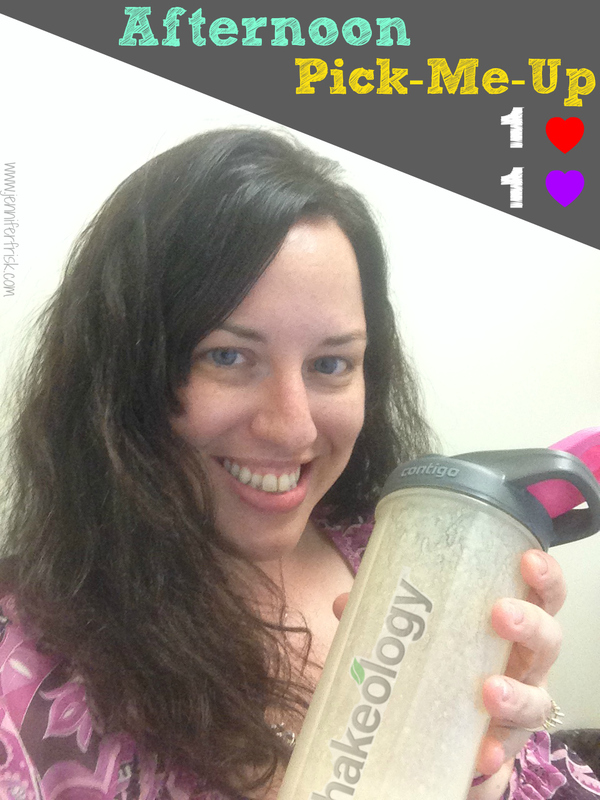 plus the nutrients from vanilla Shakeology. And I'm definitely feeling better by the time I leave for work! Dinner was quick and easy but still SOOO yummy! 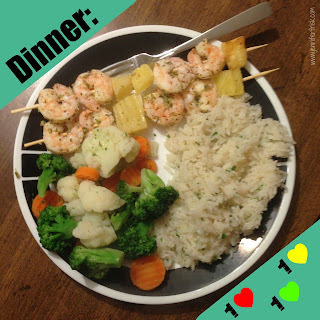 It was the first time I've ever played with skewers on a grill (something about wood over fire always made me nervous...), but I figured lime shrimp would be different grilled instead of sauteed, right? So it would count as a brand new dinner for me and hubby? Right? Add some fresh cilantro and lime juice to brown rice and throw some steamable vegetables in the microwave, and dinner is done AND well-rounded. 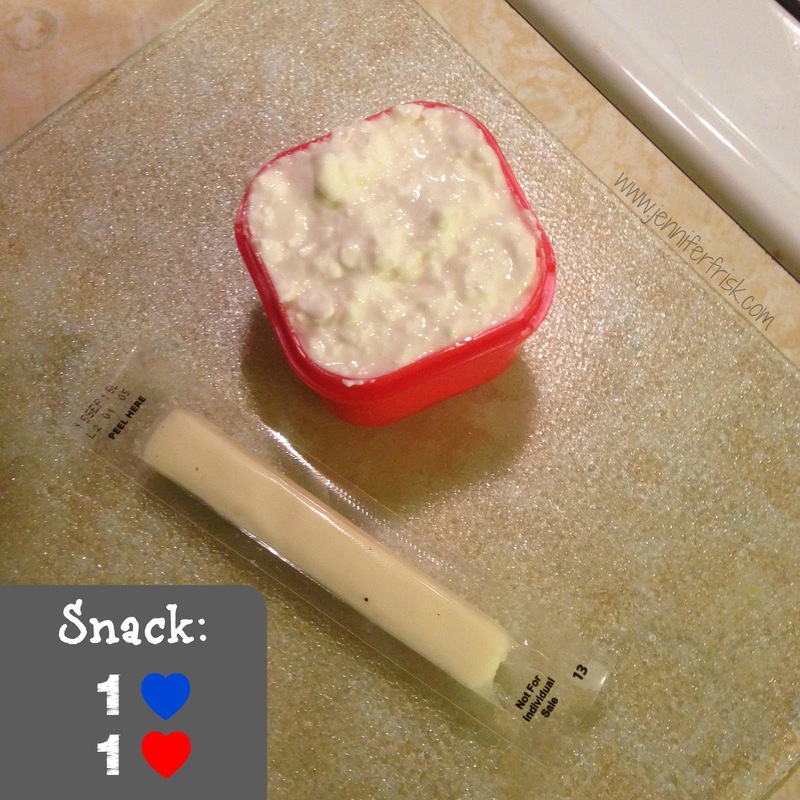 I had one more red and my blue container left for the day, so after my workout, I thoroughly enjoyed a cheesestick and cottage cheese. Side note: did you know that eating cottage cheese before bed is actually recommended for fat loss and muscle building? 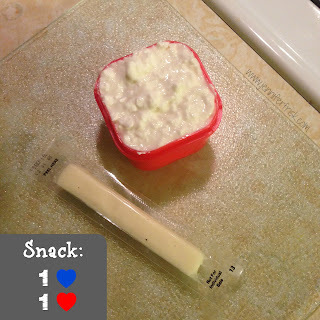 The main type of protein in cottage cheese is casein. Casein provides sustained, slow-release amino-acids (building blocks of proteins that your body uses to make other proteins) over several hours - which means your body doesn't have to break down other proteins to make new ones. You can find more information about the benefits of casein here. So, did you find this post helpful? 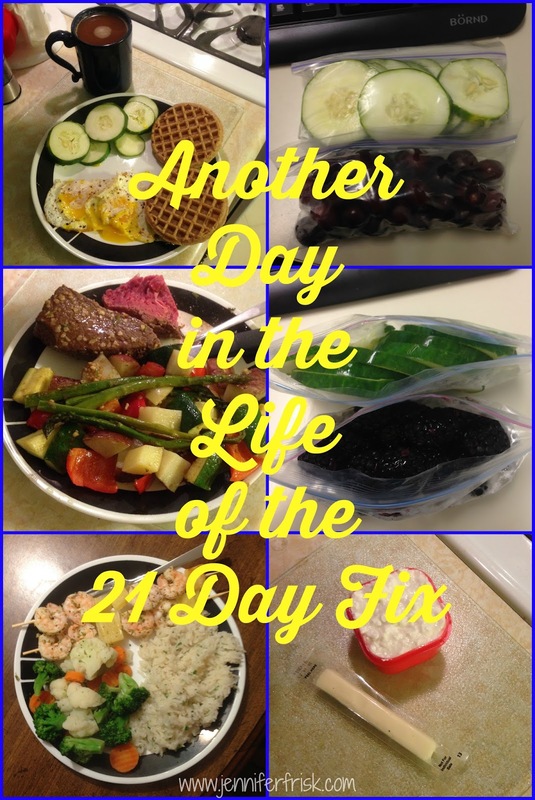 Would you like more information about the 21 Day Fix or Fix Extreme? Drop me a line or leave a comment with your email address, and I'll get back to you ASAP! Want to join my next challenge group? Fill out the application below! Do you use frozen whole grain waffles? And, do you eat them plain/dry? Thanks for the tip about cottage cheese. Good to know. Yes, I use frozen whole grain waffles, and yes, I eat them plain! I just love the texture and flavor... Plus, they are amazing at soaking up all the runny yolk goodness! Have you ever tried putting a teaspoon of coconut oil in your coffee with some stevia? That is how I get a "creamer" in my coffee and sometimes add a few drops of peppermint oil for a mock peppermint latte! It is so dang good. You have to blend it tho so the oil emulsifies and gets creamy, I use my nutribullet. I have - and you are absolutely right - it VERY good! Unfortunately, I'm "lazy" in the morning and don't want to clean my blender. When I have extra time, though, I have been known to add a little coconut oil and pure vanilla for a frothy, creamy "latte"!